August 13, 2012 / Jeff d.
It caught my eye because I’ve had the same problem before – all excited about these new, crazy marshmallows only to be disappointed with the results. 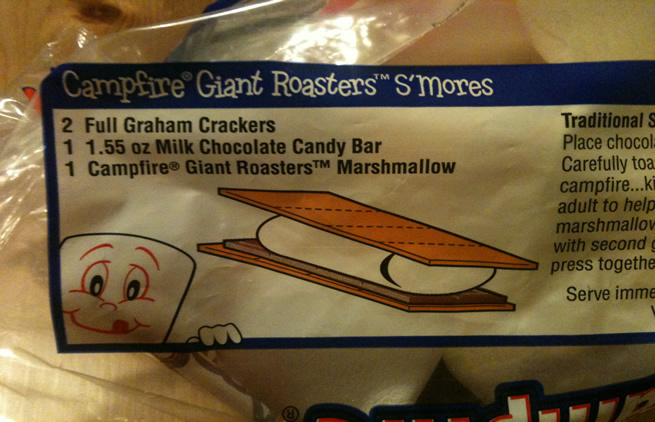 You bought the giant marshmallows because you thought it would be cool; then you realized it “messes up the chocolate to marshmallow ratio.” So, assuming that the “perfect s’more” consists of two graham cracker halves, one normal marshmallow, and three “pieces” of chocolate (or 1/4 of a bar)…how do we fix it with these jumbo things? Option 1) Do we just cut the marshmallow? Where do we cut it? To me this is cheating because it wastes marshmallow! Option 2) Without cutting it, can we add graham cracker and chocolate and find just the right number to make the ratios work out correctly? Taking the problem this direction makes it very similar to Dan Meyer’s “Nana’s Chocolate Milk” problem – which I’ve used in class. They are doubling the graham cracker and doubling the chocolate. How close are they? Option 4) Alright, why don’t we just send someone back to the store to get smaller marshmallows. Uh oh…they got the wrong kind again! Now how do we fix it? Now the relationship between surface area and volume comes into play. 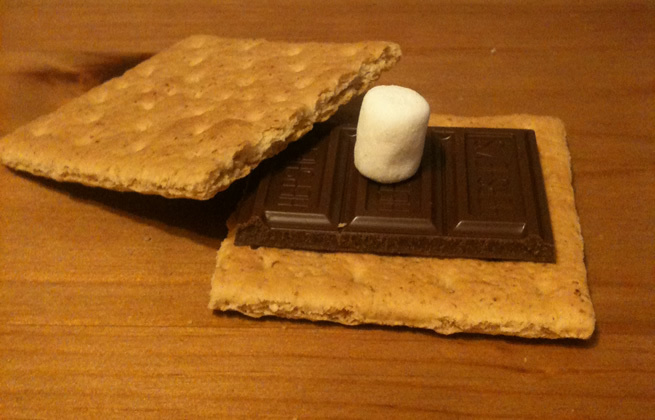 Assuming that the perfect roasteyness is a golden brown outer layer of the regular sized marshmallow, how can we get the same surface-area-to-volume ratio with the giant (or small) marshmallows? We could also complicate things further by using my favorite s’more-making method: catch the outside on fire, blow it out, then take that charred layer off. I then eat it that way, but couldn’t you now roast what’s left? Alright, I think I’ve gone far enough with this. Yep…used a lighter. It’s raining right now, do you expect me to start a campfire? I’ve said it before: I like messy problems, and this one fits the bill. There are certainly multiple – if not infinite – solutions to most of these questions. And, you get to eat the results (I’m full now). Enjoy. Very cool! Totally want to use this for my Perimeter, Area, and Volume unit! This is awesome. Great camera work too, which is often undervalued in these kinds of tasks. With each of the three S’mores (mini, regular, maxi) you fixed the S’more in the frame. Big win. Thanks Dan, I appreciate the feedback. I have to say, though, that the only forethought I gave to the photography was to clean off the table first. But it turned out well enough I suppose.